Timur enjoys playing with his mother, who takes a more active role. Dilyana grew up in a family and works as a teacher. So why does she need Sunflower’s help to raise her 3-year-old son, Timur? Women who grew up in children’s homes are very vulnerable to all kinds of domestic abuse and exploitation. Our partners at Sunflower work a great deal on what a healthy, trusting relationship looks like. They also support any of the young women in their group who find themselves in relationships that worry them. Today, on International Women’s Day, we are proud to share Vera’s story with you. She has shown great strength in recognising she was being treated badly and in standing up for herself. Thanks to you, Sunflower has been able to support her as she makes sense of what happened to her. “Vera moved out of her children’s home into a flat this September, but she has been a member of our project for 3 years. We helped her prepare for the big move, and we knew that she was anxious about going it alone. At first it seemed as if all was going well. Vera furnished her flat, found out how to pay her bills, and was enjoying inviting her friends over to her new place. After a while, Vera admitted to us that she wasn’t living alone. She was living with her boyfriend, who had helped her choose her furniture and doing minor repairs to the flat etc. It was very important to her that she had someone she could rely on. It wasn’t long before Vera told the support group that she and her boyfriend argued from time to time. Apparently he said that she “spent too much time with her friends and should only see him.” After one of their arguments, he shouted at her and made a swing at her. Vera immediately broke it off with him and asked him to leave the flat. Before he left he broke her phone, stole anything of value as “payment” for the repairs he had done, and cut up her bank cards. Vera was frightened and didn’t know what to do, so she turned again to us. With our detailed instructions, she was able to report the theft to the police. She still felt humiliated and confused, but has been working through those feelings in individual counselling and group support sessions. Now she can value the positive relationships she has managed to build with friends, but will also be more careful about who she lets into her life. The young people that Sunflower supports all grew up in orphanages. They learn to value themselves and to recognise their emotional needs. They always have someone to turn to who will help them see situations objectively and they are able to build genuinely supportive relationships with their peers through our support groups. By supporting these groups you are helping break the cycle of domestic abuse. Sunflower, our partners in St Petersburg, help orphanage-leavers adjust to independent living. Much of their work is done through support groups, but an individual home visit can work wonders when there is a particular crisis. By donating to St Gregory’s you make this service happen. One young man who desperately needed a home visit is Roma. He grew up in an institution for deaf children and he’s now studying at college. When he lived in an institution he was quite confident. It was only when he left that he began to be afraid. Roma was given a flat, but it was a long way from the part of the city that he knew, and even after he was given the right to live there he continued living in a hostel. Like all the others, Roma is very scared of somehow being conned out of his flat by some “dangerous” people, so it is difficult for him to see his new home as secure and stable. With Sunflower’s social teacher, Roma worked out a convenient route from home using his travel pass. They visited his new flat. They got to know the surrounding area and found out where the doctors’ surgery, the post office and other local services are. They worked out what furniture he would need, made a budget and together made a few purchases, teaching Roma how to do this independently in future. Lastly, the social teacher connected Roma with some local organisations that can help people with his disability, and helped him explore how he could spend his leisure time. Seeing the smile on Roma’s face visiting his new flat makes it all worth while. Hopefully, he will also be able to join in the group activities and continue to grow in confidence and problem-solving ability. It costs just £7 to make a home visit to someone like Roma, but you can see what a huge difference it can make to someone’s life. For most children in Russia, kindergarten is the first step in a their education and the first experience of a life outside the family. This is a stage that many disabled children miss out on because mainstream kindergartens aren’t equipped to look after them. There just aren’t enough places in mainstream or special provision. Yulia Bondarkova has volunteered with our partners Sunflower, to help them run their summer camp for parents who grew up in orphanages and their young children. This is her story. Download our summer newsletter to find out more about the summer camps we will be funding this year. This includes the unique perspective of one of the volunteers helping on the Sunflower summer camp for parents who grew up in orphanages and their children. We also have a full report on the training visit our colleagues from St Petersburg and Moscow made to Krakow to get new ideas on helping children with complex disabilities to communicate. From Georgia, our colleagues at Mkurnali report on the vulnerable young people that they have saved from prison recently. Dima is 22 years old and he has lived in a children’s home since he was four. This January he left and our partner organisation, Sunflower, was with him all the year. The preparation year was an anxious one. Dima was worried that something would go wrong with the accommodation he was promised. When his room was ready he didn’t move into it straight away. To start with he was only let out at weekends, which made his angry with his teachers. He fell out with his girl-friend too because she wouldn’t come shopping with him for his new room. Dima’s anxiety worried the staff at his children’s home so much that he was sent to the educational psychologist to establish whether he was capable of living independently. Dima knows almost nothing about his family, just the names of his parents and that he had a brother who died before he was born. He also found out that he has a heart condition, but not how serious it is. He only knew “that I have something terrible wrong with my heart. The doctor at the children’s home said that it is dangerous. I could die at any moment.” Step by step Dima gathered all the necessary documents, was passed by the educational psychologist, and was given his medical records. All through he would come to Sunflower with his questions. Each time he was given some new information he would think about it carefully. Now he says, “it turns out that my illness isn’t that terrible. I simply have to avoid putting a heavy strain on my heart. I was given all the necessary treatment when I was little”. When Dima finally moved into his bed-sit, he had difficulties which he wasn’t prepared for. He is frightened to take decisions, is scared to break into his small savings, and finds it difficult to be alone after work. He discusses these worries with Sunflower and they are teaching him how to manage a budget and helping him find ways to spend his spare time. Dima’s story shows how vital it is to look after the mental health of young people leaving the orphanage system. Sunflower listens to their fears and we also give them the skills to tackle their problems head on. None of this is quick or easy, but, thanks to their support, Dima will still be benefitting for many years to come. If you’d like to help Sunflower continue their vital work you can donate at any time. However, if you donate via our page on Global Giving between 9th and 13th April, 2018 a 50% bonus may be added to your donation up to £35 or $50. Download our winter newsletter to find out how our Alternative Technology programme helps find different ways to communicate for young disabled people who cannot speak, how we hosted Father Lev and his helpers from the Kondopoga Parish in the UK and about their plans after their return to Karelia, how Sunflower helps Russian orphans to be independent, and how our legal programme run by Mkurnali helps save young people from prison. We all take being able to communicate for granted, but just imagine if, aged just 15, you had had to face spending the rest of your life virtually house-bound and unable to communicate with anyone. This is the future for many disabled people like Gleb in Russia today without our help. This is why we are launching our Christmas appeal to bring them the chance to communicate. Our Alternative Technology programme is about finding different ways to communicate for disabled young people who can’t speak and may never speak. It is about opening up the world and giving them the possibility of making friends. And it works! Gleb is 19 and an only child. He does not speak because of a rare genetic syndrome, which affected his development from the first months of his life. He needs to be accompanied and helped in his daily life. Gleb is a sociable and determined young man and he is happiest when he is busy. But he can only communicate by a gesture or a sound so communication is critical for his development, making new friends and exploring the outside world. Unfortunately there are simply no other facilities in Moscow which can offer disabled young people a chance to be active in the community and give them a different perspective on life. Zhanna is totally focussed on helping and encouraging her son. 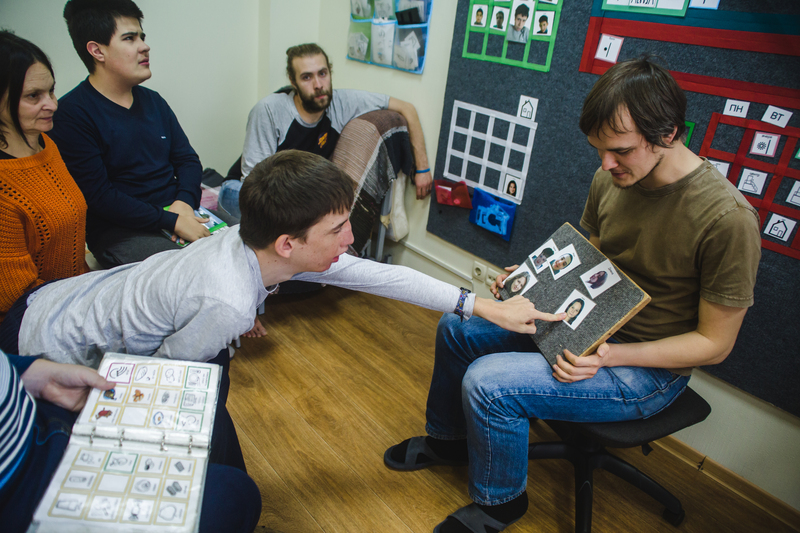 Since he was 10, Gleb has been attending sessions at “Communication Space”, our partner charity in Moscow. Since the start of our Alternative Technology programme last year Gleb also began using special books and software which help even more to express himself through signs, symbols and gestures and he is making big progress. Find out more about how our partners help Gleb and others like him in this short video.